In an old Parish Magazine dated April 1960 there were four pages of advertisements for local shops and businesses. Of the 24 adverts only seven were for addresses which were not in Wollaston. The rest give a good picture of shops you could visit in the village. They included some very long established ones and although some of the buildings remain the businesses are quite different. In this example J.S.Keeble came from Wollaston but his business was in Beauty Bank Crescent just over the Wollaston boundary. B & W Builders were in Enville Street, sections of which were in Wollaston. 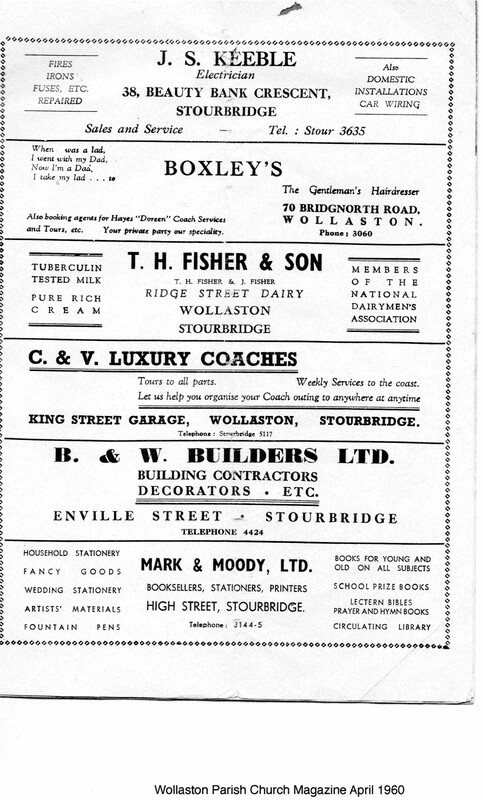 Mark & Moody was a long established outlet in Stourbridge which closed in the last years of the 20th century.